The effective temperature of a body such as a star or planet is the temperature of a black body that would emit the same total amount of electromagnetic radiation. Effective temperature is often used as an estimate of a body's surface temperature when the body's emissivity curve (as a function of wavelength) is not known. When the star's or planet's net emissivity in the relevant wavelength band is less than unity (less than that of a black body), the actual temperature of the body will be higher than the effective temperature. The net emissivity may be low due to surface or atmospheric properties, including greenhouse effect. The effective temperature of a star is the temperature of a black body with the same luminosity per surface area (FBol) as the star and is defined according to the Stefan–Boltzmann law FBol = σTeff4. Notice that the total (bolometric) luminosity of a star is then L = 4πR2σTeff4, where R is the stellar radius. The definition of the stellar radius is obviously not straightforward. More rigorously the effective temperature corresponds to the temperature at the radius that is defined by a certain value of the Rosseland optical depth (usually 1) within the stellar atmosphere. The effective temperature and the bolometric luminosity are the two fundamental physical parameters needed to place a star on the Hertzsprung–Russell diagram. Both effective temperature and bolometric luminosity depend on the chemical composition of a star. The effective temperature of our Sun is around 5780 kelvins (K). Stars have a decreasing temperature gradient, going from their central core up to the atmosphere. 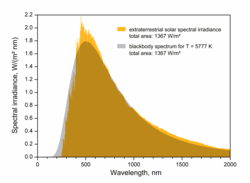 The "core temperature" of the Sun—the temperature at the centre of the Sun where nuclear reactions take place—is estimated to be 15,000,000 K.
The color index of a star indicates its temperature from the very cool—by stellar standards—red M stars that radiate heavily in the infrared to the very hot blue O stars that radiate largely in the ultraviolet. The effective temperature of a star indicates the amount of heat that the star radiates per unit of surface area. From the warmest surfaces to the coolest is the sequence of stellar classifications known as O, B, A, F, G, K, M.
A red star could be a tiny red dwarf, a star of feeble energy production and a small surface or a bloated giant or even supergiant star such as Antares or Betelgeuse, either of which generates far greater energy but passes it through a surface so large that the star radiates little per unit of surface area. A star near the middle of the spectrum, such as the modest Sun or the giant Capella radiates more energy per unit of surface area than the feeble red dwarf stars or the bloated supergiants, but much less than such a white or blue star as Vega or Rigel. To find the effective (blackbody) temperature of a planet, it can be calculated by equating the power received by the planet to the known power emitted by a blackbody of temperature T.
Take the case of a planet at a distance D from the star, of luminosity L.
Note that the planet's radius has cancelled out of the final expression. The effective temperature for Jupiter from this calculation is 88 K and 51 Pegasi b (Bellerophon) is 1,258 K. A better estimate of effective temperature for some planets, such as Jupiter, would need to include the internal heating as a power input. The actual temperature depends on albedo and atmosphere effects. The actual temperature from spectroscopic analysis for HD 209458 b (Osiris) is 1,130 K, but the effective temperature is 1,359 K. The internal heating within Jupiter raises the effective temperature to about 152 K.
The surface temperature of a planet can be estimated by modifying the effective-temperature calculation to account for emissivity and temperature variation. Note the ratio of the two areas. Common assumptions for this ratio are 1/4 for a rapidly rotating body and 1/2 for a slowly rotating body, or a tidally locked body on the sunlit side. This ratio would be 1 for the subsolar point, the point on the planet directly below the sun and gives the maximum temperature of the planet — a factor of √2 (1.414) greater than the effective temperature of a rapidly rotating planet. Also note here that this equation does not take into account any effects from internal heating of the planet, which can arise directly from sources such as radioactive decay and also be produced from frictions resulting from tidal forces. The Earth has an albedo of about 0.306. The emissivity is dependent on the type of surface and many climate models set the value of the Earth's emissivity to 1. However, a more realistic value is 0.96. The Earth is a fairly fast rotator so the area ratio can be estimated as 1/4. The other variables are constant. This calculation gives us an effective temperature of the Earth of 252 K (−21 °C). The average temperature of the Earth is 288 K (15 °C). One reason for the difference between the two values is due to the greenhouse effect, which increases the average temperature of the Earth's surface. ^ Archie E. Roy, David Clarke (2003). Astronomy. CRC Press. ISBN 978-0-7503-0917-2. ^ Tayler, Roger John (1994). The Stars: Their Structure and Evolution. Cambridge University Press. p. 16. ISBN 0-521-45885-4. ^ Böhm-Vitense, Erika. Introduction to Stellar Astrophysics, Volume 3, Stellar structure and evolution. Cambridge University Press. p. 14. ^ Baschek (June 1991). "The parameters R and Teff in stellar models and observations". Astronomy and Astrophysics. 246 (2): 374–382. Bibcode:1991A&A...246..374B. ^ Lide, David R., ed. (2004). "Properties of the Solar System". CRC Handbook of Chemistry and Physics (85th ed.). CRC Press. p. 14-2. ISBN 9780849304859. ^ Jones, Barrie William (2004). Life in the Solar System and Beyond. Springer. p. 7. ISBN 1-85233-101-1. ^ "Earth Fact Sheet". nssdc.gsfc.nasa.gov. Archived from the original on 30 October 2010. Retrieved 8 May 2018.